Trips, per diems, and how they fit in with your individual expense policy. 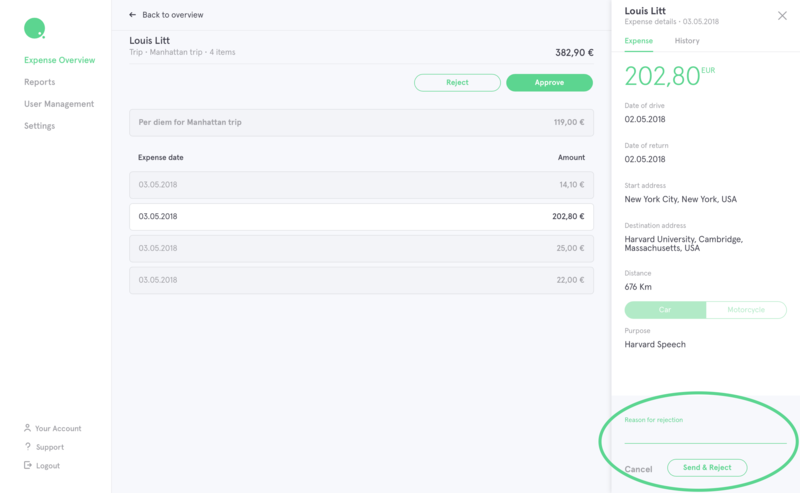 The trips feature allows accountants and supervisors to gain a greater overview of expenses that were part of a trip. 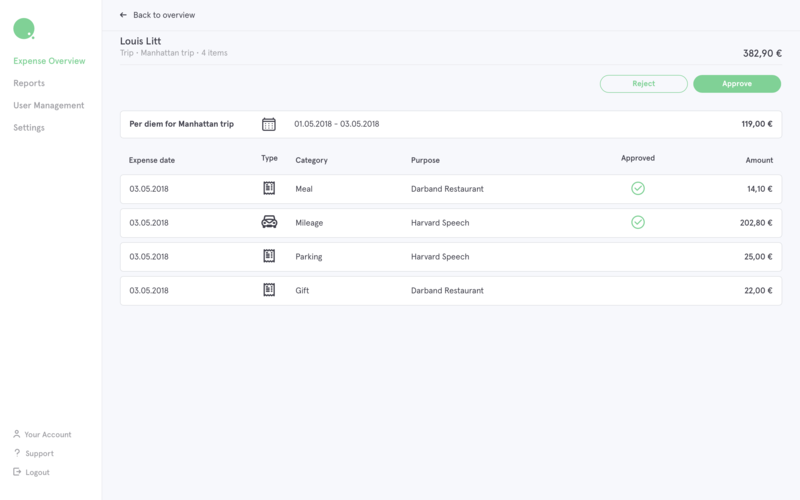 Furthermore, the usage of trips allows accountants to create single reports for individual trips, leading to greater transparency in the expensing process. Submitters can create trips and add mileages and expenses to them. Once a user clicks submit, they will be asked to fill out a few final details regarding the accommodation and meals that will allow Circula to calculate the per diem accurately. In this case, the company only paid for the Submitter’s breakfast. The Submitter paid for all the other meals and the accommodation (in per diem the equivalent of the night rate), which is reflected in their total per diem rate. A per diem itself cannot be rejected just as any other expense. Accountants can change the details of the per diem (for example, meals and inclusion of night rate) and ultimately decide whether or not the calculated per diem will be paid out or not by selecting ‘Per diem should not be paid’ in the per diem details. 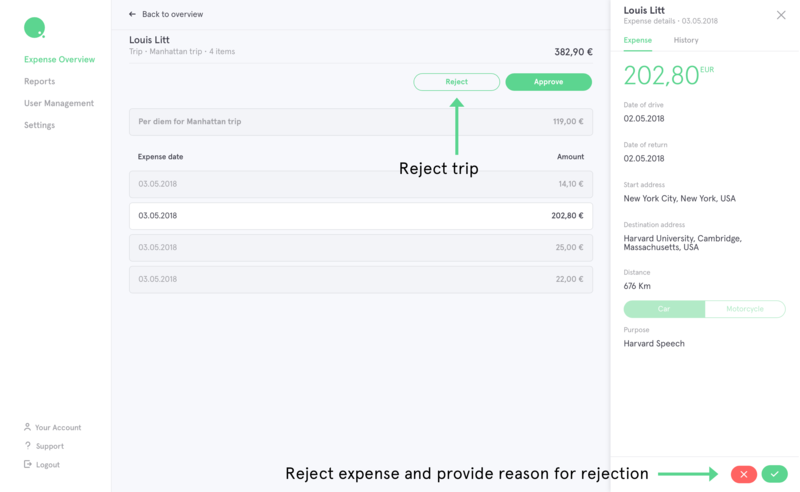 Once an expense within a trip has been rejected or approved, it cannot be edited anymore. A trip as a whole can only made ready for export once it has been approved as a whole. Approving the whole trip will also approve all expenses within it. If an expense was rejected it must be sent back to the Submitter for review to be edited. Rejecting a whole trip will cause it to be sent back to the user. The Submitter will then automatically see which expense specifically need to be reviewed. Therefore it is best to select the single expense that needs review and to add a rejection reason to it before sending it back to the Submitter. The status of all other expenses within that trip will not be changed. If you would like to know more about per diems, please read our FAQ about how a per diem is calculated.